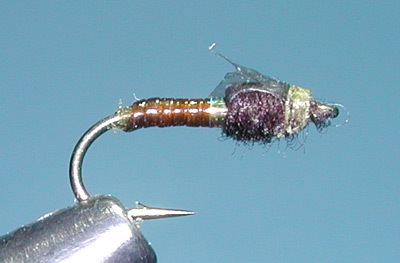 The Medallion Midge was developed by Pat Dorsey of Colorado. Pat has developed numerous midges such as the Mercury Midge and the Mercury Black Beauty. He wanted a pattern that tended to be a little more realistic when the trout were more selective and could closely inspect the pattern within a stillwater or slow Spring Creek condition. The Medallion Sheeting met most of the aspects he wanted for wing buds and shellbacks and this material became associated with the pattern. There are similar materials such as Spirit River's Wing & Things or Bett's Zing Wing that can be used as a substitute. The plastic material is pulled over the thorax for a shellback. It will trap air bubbles underneath the material to offer a lifelike appearance imitating the gaseous bubbles that is formed within the naturals. Another strip is attached to form the wing buds. The pattern can be tied within a number of colors such as Brown, Black, and Chartreuse. The one common theme is that it will always utilize a white 6/0 thread ribbing. This ribbing a spirolled around the body with a width of the thread diameter. Pat normally fishes this pattern as a dead drift with a strike indicator and small split shot. 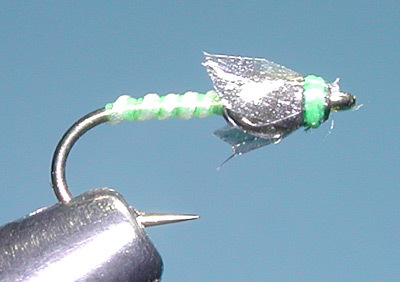 Depending on the selectivity of the trout, Pat might employ a two midge rig or drop the Medallion Midge off another dry midge such as a Griffith's Gnat. There are times when the trout will feed on midges within the surface film. 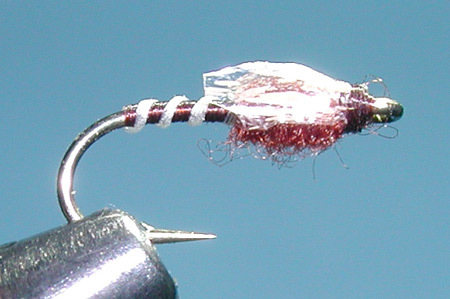 During these situations, Pat will use a greased leader technique in which he apply a paste floatant to the leader up to 12" from the fly, this will allow the fly to lay within the surface film or slightly below. You will encounter another pattern called Steve's Midge and this might be erroneously identified as a Medallion Midge. Steve Parrott of Blue Quill Angler's developed this pattern. It is actually a different pattern yet similar in that it utilizes the Medallion sheeting for the shellback and wing buds. However, the wings buds are formed from the same strip as the shellback. Once the strip is pulled over the thorax, the tag end is divided into two strips and pulled back on each side of the thorax towards the bend as wing buds. The body is also different as it uses another one of Shane Stalcup's signature materials, Micro-tubing. 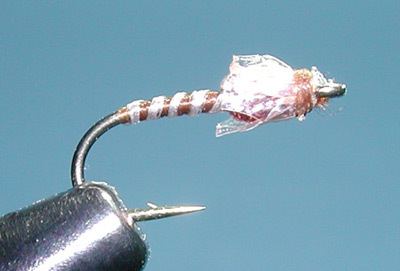 A piece of pearlescent tinsel is wrapped just behind the thorax location for a trigger spot.